Back pain problems are getting quite common, especially amongst the middle aged persons. Stressful working schedules, coupled with extensive working hours are some of the causes behind back pain problems. To get rid of back pain, exercises and various other medications are suggested. 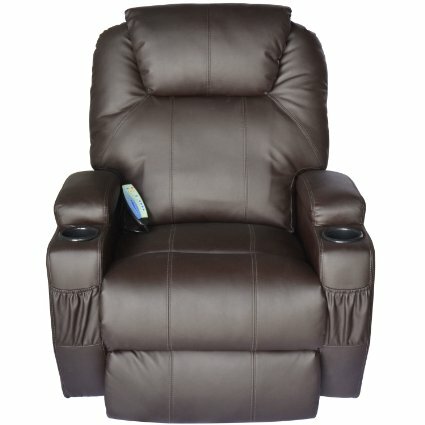 One of the best ways to sooth your back is bringing home a new recliner. 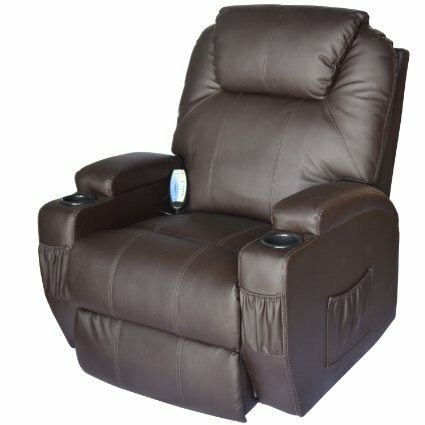 Recliner chairs are meant to provide relief from back pain or spinal soreness. 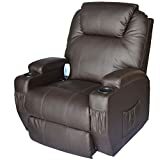 HomCom Deluxe Heated Vibrating PU Leather Massage Recliner Chair not only gives comfort or rest to your back, but also offers vibrating massage therapies. The product upholstery has been manufactured with PU leather. PU leather is durable and it looks sophisticated. The product comes with two cup holders at the arms and side pockets, where users can store books or newspapers. 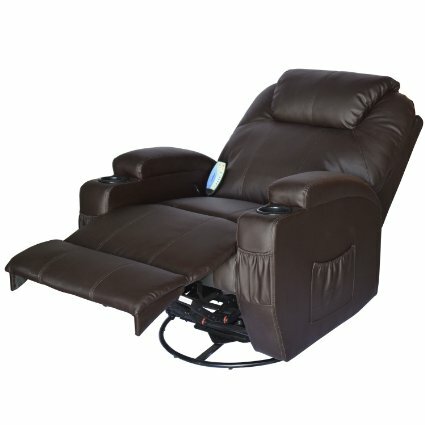 The recliner offers vibrating massage therapies. Preset massage functions render flawless blood circulation and thus heal back pain problems. The chair can recline and spin 360 degree. The chair has been cushioned to provide coziness though cushion system is not soft. Vibration speed is controllable, but the speed is not really high. Foot rest is a problem for many users, especially if you have large feet. 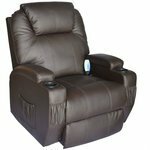 HomCom Deluxe Heated Vibrating PU Leather Massage Recliner Chair is manufactured with PU leather upholstery. The pretty red color of this product looks good and goes well with modern house interiors. PU leather quality is good and thus promises durability. 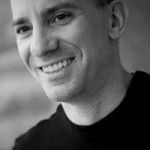 The product is well-equipped with a few small, yet notable functionalities. For example, it comes with cup holders at both its arms. 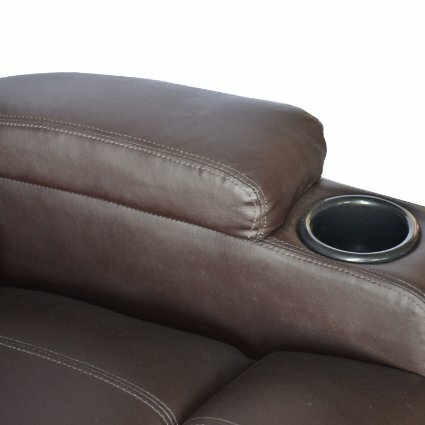 So while reclining, you can also enjoy a cup of coffee or some other beverages. Of course, it is needless to say that do not leave cup or glass of your drink, while you are using the vibration functions. It also has side pockets, where books and magazines can be kept easily. The chair permits complete reclining facility. It can rotate 360 degree and also can vibrate. Additionally, the back portion can be heated to heal paining backs or spines. Vibration and heating functions can be manipulated with remote controller. The remote controller features five preset massaging functions. Massaging speed can be controlled with the remote controller. Two basic speed controlling options are there – high and low. 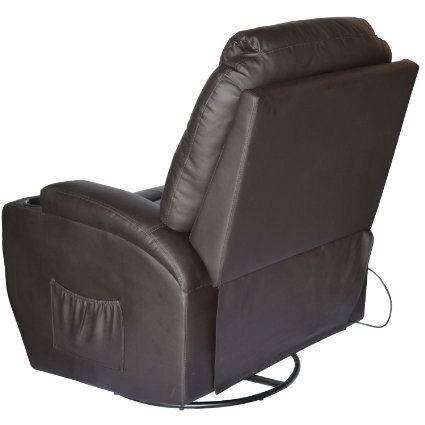 Back rest as well as foot rest can be adjusted according to the convenience of the users. Padded cushioning system provides good comfort though cushioning system could have been made more comfortable. 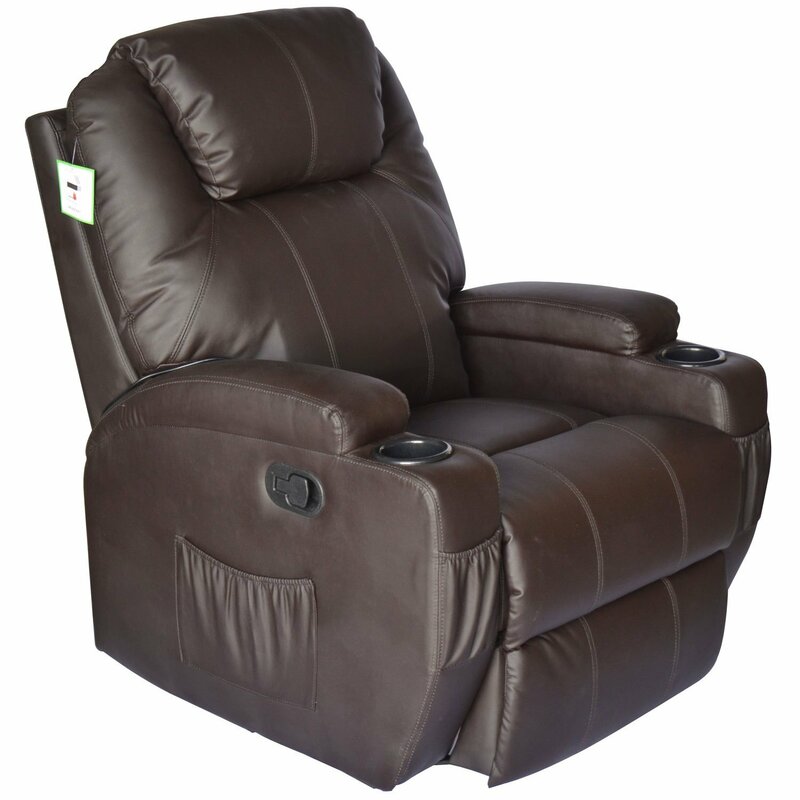 Few users have found this recliner to be stiff, though it is not discomforting by any means. 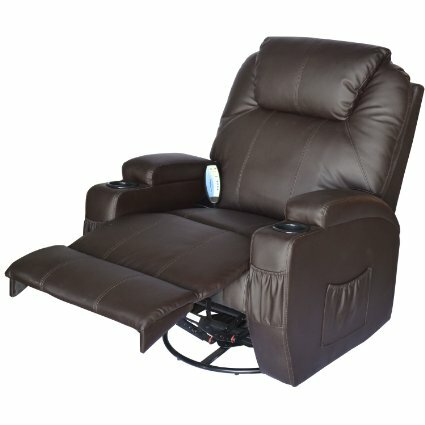 HomCom Deluxe Heated Vibrating PU Leather Massage Recliner Chair is a perfect product for home back pain massaging as well as healing therapies. With its preset massaging functions, users can easily avail effective massage therapy for their paining back. It has four massaging focal areas. It soothes the back and makes the blood circulation seamless. Overall, it is a good product to buy.